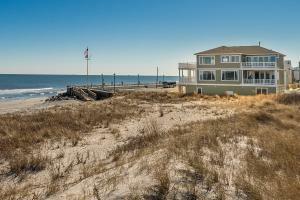 BRIGANTINE, NJ, USA, April 5, 2019 /EINPresswire.com/ -- A 4,087+/- SF five bedroom, four and a half bath, single-family home at the top of the northern end of Brigantine, is going up for Auction! This dramatic direct oceanfront home with sweeping, panoramic views of Brigantine’s pristine preserved North End is being auctioned by Max Spann Real Estate and Auction Co. Previously asking from $2,900,000, the home now is guaranteed to sell at or above the minimum Bid of $1,300,000. This beautiful home features reverse living with spacious kitchen and open great room, grand master suite, private oceanfront decks. An Open House is scheduled from 12:00 noon to 2:00 p.m. on Sunday April 14th onsite at 1415 E. Brigantine Avenue, Brigantine, NJ 08203. The auction is scheduled for Thursday, May 9, 2019 at 1:00 p.m.